Sub: Use of Aadhar in Benefit Schemes of Government-Exception Handling-reg. Ref: This office circular No. 197 dated 10.01.2018. Consequent upon introduction of Aadhaar Act, 2016, an individual eligible to receive the pension benefits is required to furnish proof of possession of Aadhaar number or undergo Aadhaar authentication. However, Ministry of Defence, Department of Ex-Servicemen Welfare Notification No. 14(2)/2014/D (P/P)(Part-I) published in Gazette of India in 03.03.2017 vide No. S.O. 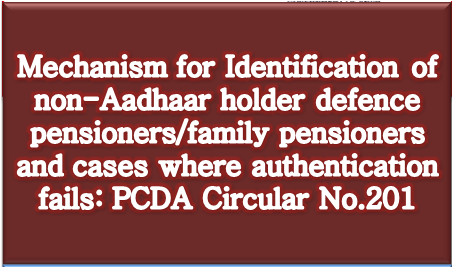 747(E), circulated to all PDA under circular quoted above, provides that, till the Aadhaar is assigned to the beneficiary of pension benefits, benefits shall be given to such individuals subject to the production of certain identification documents as indicated in Notification No. S.O. 747(E). 2. Now, considering the incompleteness of Aadhaar enrollment process and difficulties in online authentication due to infrastructure constraints, Cabinet Secretariat( DBT Mission), vide OM No. D-26011/04/2017-DBT dated 19.12.2017(copy enclosed), has suggested/issued guidelines to adopt the mechanism for extending the benefits to beneficiaries who do not possess Aadhaar and in cases where Aadhaar authentication fails. 3. All the Pension Disbursing Authorities are, therefore, requested to follow the above guidelines in process of identification/annual identification of defence pensioriers/family pensioners. Subject: Use of Aadhaar in Benefit Schemes of Government – Exception Handling -Regarding. Aadhaar based DBT is a significant governance reform to ensure greater transparency and accountability in public service delivery through effective use of technology. Aadhaar as an identity proof obviates the need for producing multiple documents for proving one’s identity, thereby simplifying procedures and eliminating fake/ ghost beneficiaries through de-duplication. i. The beneficiary shall be provided subsidy, benefit or service based on alternate identification document as notified in the relevant notifications issued under the provisions of Section 7 of the Aadhaar Act, 2016.
ii. Efforts should be made to ensure that all such beneficiaries are facilitated for enrolment under Aadhaar. The concerned Department through its Implementing Agencies may offer Aadhaar enrolment facilities for such beneficiaries at convenient locations through centres in the respective Block/ Taluka/ Tehsil (including through Post Offices, Banks, ICDS Centres etc). iii. As per regulation 12 of Aadhaar (Enrolment and Update) Regulations, 2016, the State Government/ Implementing Agencies should also make special arrangements for bed ridden, differently-abled, or senior citizens, who are unable to visit the registration centre(s), to get them enrolled for Aadhaar. iv. Till such time Aadhaar is assigned to a beneficiary, a separate register, preferably electronic, shall be maintained for recording such transactions, whenever the beneficiary is provided benefits/ services on the basis of alternative identification documents. This register may be periodically reviewed and audited. i. Departments and Bank Branches may make provisions for IRIS scanners along fingerprint scanners, wherever feasible. ii. In cases of failure due to lack of connectivity, offline authentication system such as code based coupons, Mobile based OTP or TOTP may be explored. iii In all cases where online authentication is not feasible, the benefit/ service may provided on the basis of possession of Aadhaar, after duly recording the transaction in register, to be reviewed and audited periodically. 3. In view of above, DBT implementing Ministries/ Departments and State Governments are requested to implement proper exception handling mechanism in conformity with the Aadhaar Act 2016 and subsequent regulations and guidelines issued from time to time. A robust mechanism for ensuring their compliance and its periodic monitoring may also be put in place. Guidelines to adopt the mechanism for extending the benefits to beneficiaries who do not possess Aadhaar and in cases where Aadhaar authentication fails.